Having invented the minivan segment, the 2017 Dodge Grand Caravan is still in the hunt. 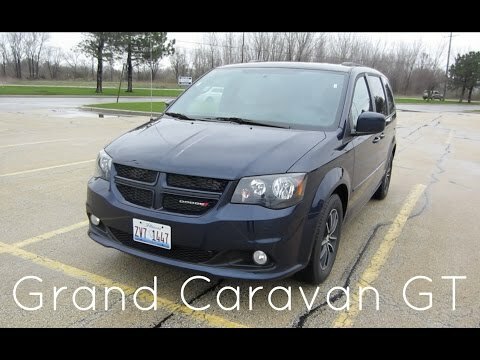 While not the newest or best-equipped minivan, the Grand Caravan's low price, clever storage and seating features and potent standard V6 engine make it a tempting prospect for families on a tight budget. Will always own a Dodge Grand Caravan power, safety, comfort, looks. Perfect! I am an owner of 2 Dodge Grand Caravans. I had a 2007 Dodge Grand Caravan and needed to get another car to replace my husbands older vehicle and I started looking at many different minivans. I had rented a 2017 Dodge Grand Caravan and loved the comfort and safety features. As a mother of 2 younger children the convenience of the dual doors was a must. I found a 2017 Dodge Grand Caravan and fell in love. It is the most comfortable vehicle I have ever driven! The things that my kids love the best is the middle seats windows go down unlike our 2007. The Bluetooth and rear camera are also big hits with the kids. For me the rear hatch automatic lift is so important when loading groceries. With my key fob I can open the doors and most importantly I can start the car. This is so important on those cold mornings when I take the kids to school. The driver's seat is so comfortable and the arm rest makes me feel secure and cozy while driving. This van has so much room and places to store everything without looking cluttered. Any where you sit there is a cup holder and the center console has room for everything. There are plenty of places for everyone to charge their phone or other devices. The stereo is amazing and the hands free phone makes it safe to talk while driving. The stow and go seating is easy to use and allows for even more room! To top it off it looks amazing. Even my husband loves to drive it. The Dodge caravan is eco friendly and has incredible amounts of space. This van has by far been the best investment our family could have gained. The seats fit inside the floors which gives you an amazing amount of space. We use it for personal and work use. It is great on gas (for a van). Only one problem, the locks have been acting crazy and we have only owned the vehicle for a little over a year. I have no other complaints other then the electronic system. The radio sometimes will not come on when I start the van. Does not happen very often though. My kids love all the free space they have. It makes any trip; long or short, relaxing. This is the first Dodge I have ever owned and I highly recommend he newer models of the Dodge grand caravan. 2017 Dodge grand caravan, great car for space and room for kids as well as pets. I love this car it has so much room in it, for having a dog and 1 child I love the space it provides. Though I did get it used and it had a back window problem, I still love the car and I will most likely be getting a new one later on. Mine is a 2017 but when they come out with more I will be trading this one in for another one. Comfort was a big thing I was looking for and it has it the front seats are great for long distance driving as well and having the space for packing things when moving. Before I got the van I wanted a truck but since I have had this van I love how much space it has in it compared to a truck.